It’s true—there’s nothing quite like a big gummy smile from a happy baby, particularly after a long night of teething and little sleep. What’s more, however, is the satisfaction of seeing a few baby teeth erupt. Though it’s a time for celebration, it’s also an important time to begin practicing pediatric dental care. 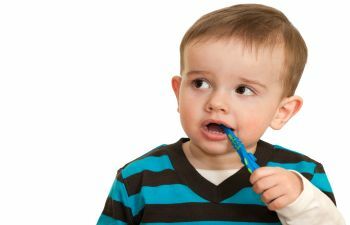 In fact, good oral hygiene starts as early as infancy, explains Colgate, and it’s wise to wipe down a child’s gums with gauze or a wet washcloth even before primary teeth emerge. This helps ensure that a child’s baby teeth are free of decay and bacteria, and also establishes a healthy foundation for permanent teeth. As a rule, it’s best to schedule a child’s first dental appointment when his or her first teeth begin to erupt, or at least by the first birthday. In doing so, parents are equipped with the right tools to help establish a lifetime of good oral health for their child. The first pediatric dental appointment typically focuses on learning expert tips on how to properly brush and floss a child’s teeth. Of course, it is also an important time for a dentist to check the condition of a child’s teeth, and address specific concerns. Along with oral hygiene, the child’s diet will likely be discussed. Generally, parents are advised to steer clear of starchy foods and those with high amounts of sugar. In addition, parents are warned about allowing their child to go to sleep with a bottle of milk or juice, as this is a chief cause of tooth decay. Furthermore, a child’s first dental appointment is also a time to debunk myths and answer questions regarding the future of a child’s dental health. Though baby teeth eventually fall out and are replaced by permanent teeth, it is critical that these teeth remain healthy. After all, primary teeth play a large role in a child’s speech development, not to mention helping them eat and chew food properly. Because root systems and permanent teeth rest below the surfaces of baby teeth, having healthy gum tissues is vital. With a full scope of pediatric dental services, Alora Dentistry provides specialized dental cleanings and treatments that adhere to a child’s specific needs. Most importantly, we provide peace of mind to parents with compassionate and comfortable dentistry focused on preventative care. To schedule an appointment for your child, adolescent or teen, call Alora Dentistry in Napa Valley today.